Amsterdam Airport Schiphol is the main international airport of the Netherlands. 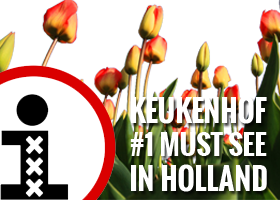 It is the primary hub for its national airlines (KLM, Arkefly, Corendon Dutch Airlines, Martinair and Transavia), as well as some European airlines (Delta Air Lines and Vueling). The airport has the IATA code ‘AMS’. Amsterdam Airport Schiphol has a large shopping area. In this indoor shopping area, there are more than 100 shops, opened 7 days a week. Schiphol plaza is the shopping center before passport control and there are naturally many shops after passport control. Even the Rijksmuseum has a small venture located at the airport (beyond passport control between piers E and F). Original artworks from the Rijksmuseum collection can be seen here. Rijksmuseum Schiphol is open daily from 7 am until 8 pm and free of charge by showing a valid boarding pass. Additionally, next to the museum, there is an airport library with more than 1200 books (translated in 29 languages) all about the Dutch history and culture. E-books and music can be downloaded here for free to a laptop or mobile device. Furthermore, Amsterdam Airport Schiphol offers a view spotting areas for the real aviation enthusiasts, such as the ‘Panoramaterras’. Just underneath the passenger terminal complex, there is a railway station offering transportation into several cities, including Amsterdam. Every 5-10 minutes a train connects Amsterdam Airport Schiphol to Amsterdam Central Station and will cost approximately EUR 5 for a single journey (price includes EUR 1 surcharge for single use chipkaart). 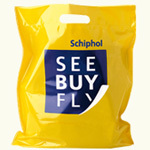 You can plan your trip with the exact times using the website www.ov9292.nl. Even the international high speed train ‘Thalys’ stops at Schiphol Airport, connecting Antwerp, Brussels and Paris. Outside, in front of the terminal building / main plaza, a bus station is located. To reach Amsterdam city center (closest destination is Leidseplein), take bus 197 (Amsterdam Airport Express) or N97 (Nightliner) from platform B9. Furthermore, the most expensive way of transportation is using a taxi. Taxis can also be found just outside the main entrance. Normally, a trip into the city center will be 20 minutes and the price will be around EUR 35 – EUR 45 depending on destination and route. 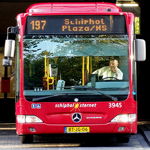 A cheaper alternative, offering door-to-door services as well, is using Schiphol Hotel Shuttles. Many hotels provide these shuttles as a complimentary service. However, the ‘Conexxion’ Hotel Shuttle buses leave the airport every 10 minutes between 6 am and 9 pm serving 100 city hotels (located outside the main entrance, platform A7). Buy tickets at a Connexxion desk inside, near arrivals area 1 or 4, at your hotel or online. Travel from Amsterdam Schiphol International Airport to your Amsterdam city hotel. Transfer services are available 24 hours a day, 7 days a week from EUR 19. At last, within Schiphol main plaza area, several car rental companies can be found. Schiphol airport has 165 boarding gates, divided over several piers in 3 halls. Pier H and M are the low cost piers. Click on the map to download a pdf file in your browser. Can we use a United States credit card (Master Card and Visa) in Amsterdam and Belgium? Is there a place at the airport that we can get Euros?